The beginning of Autumn is starting off with some great events on the water! Be sure not to miss out! Starting as early as September 3rd, get yourself a ticket to the largest Junk boat floatilla of 2015 Junkzilla! This event co-hosted by Junks.hk & Grouvly looks to be the most exclusive party ever held on Hong Kong waters with 6 boats serving signature cocktails from Honi Honi, Rummin'Tings, & Ozu, food provided by the Staunton's Group, 3 DJ sets including Janette Slack, Too Much, & Zelazowski, & even flyboards! Get your tickets here before its too late! Looking for to avoid the rays and get some live music while enjoying the Hong Kong skyline? Get on board with AllThatJunks on September 19th and enjoy a night of live music starring Jas Josland plus Ma & the Young Bucks while enjoying a selection of craft beer and delicious food! So what are you waiting for? Make the end of Junk Season this year a memorable one before the cold weather starts rolling in! Junks.hk, a new startup from Hong Kong, aims to bring the junk party industry up to speed. Junks.hk was covered in a great article in TECH in ASIA yesterday! They've done a great job in covering the reasons for founding and our focus on customers. Read more at TECH in ASIA. 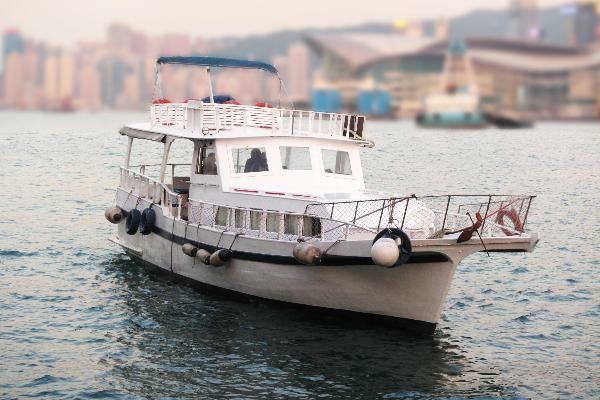 Junks.hk simplifies the booking and planning process by simply asking users what date they want to rent a boat on. A list of available junks is returned, allowing the user to choose between the day or night shift and see which slots are free. We are proud of our short history and have a great pipeline of features coming! Got any great ideas to make your life easier? Contact us and we will see if we can fix it for you! Also sign up with us here or join our growing facebook and twitter fanbase to keep up to date with our goings on. Now that you have safely made it onboard with your beer, food, and hopefully all your friends... lets hope you prepared everything else you need for your junk trip! Budgiesmugglers, bikinis or boardies - All you really need to do is cover up your junk. Other than that the more florecent and outrageous the better! Sunscreen - Despite the smog and clouds you will be scantily-clad all day and your office dwelling skin can't take the heat on its own. Do yourself a favor and lather up! Water - Day drinking is great... but you need to rehydrate. It's likely that your boat isn't already stocked with water so it's always smart to BYO. A hat - If the sun is shining you probably should cover up the top. If you are like us then the second layer of sunscreen never happens, we're just too damn busy having fun! You didn't flake on this boat trip so make sure you aren't the one visibily flaking at the office next week! Towel - It's doubtful your junk boat provides towels (If it does then dayum, invite us next time!). Don't be that guy or gal who drys off with someone elses towel! Beerkoozi - The summer is HOT. But your beer shouldn't be! Keep'em cool with your own koozi or grab one of our koozi's next time you see them! On any boat trips booked with Junks.hk you will find a stash onboard already! Sunglasses - Even if you aren't hungover, a combination of the heat, sun, humidity, and aforementioned scantily-clad revellers make these a must! Get a cheap pair from across the border or the closest night market though as these are the most commonly lost items! Wallet - Chances are you haven't paid for your golden ticket onboard your friend's junk boat. More on that subject coming soon but don't be a freeloader! and once you are ten beers deep you'll be needing that wallet to take LKF by storm (until 8:00pm). Cellphone/Camera - We know you don't leave home without this. But you'll be wanting to Instagram your day out with friends (don't forget to add #junkshk to your post!). Also, a cellphone makes for a makeshift jukebox so you can perform mic takeovers with the music selection you should probably keep to yourself! 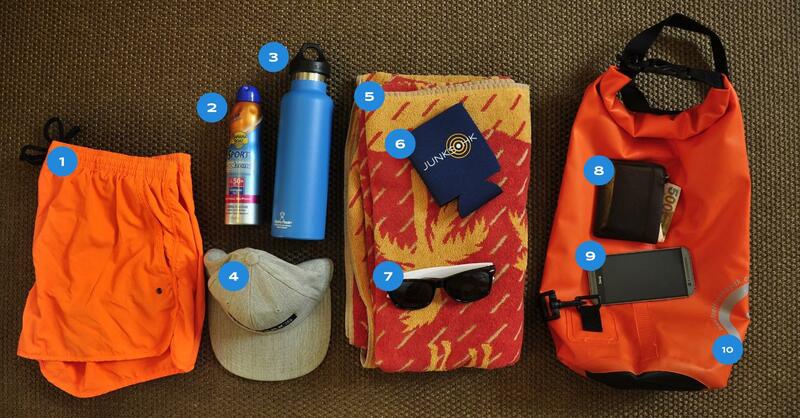 The waterproof bag - Don't put your belongings at risk of water damage, a change of weather, or your drunken debauchery. One of these bags runs up about 150HKD from any dive shop around town and are lifesavers! Aside from these, anything else is optional but keep in mind that your ride out to your destination can be choppy so if you get sea sick then some pills to settle your stomach might be a good investment! Get Cali-Mex on the high seas!! Through Junks.hk’s online boat booking marketplace customers can now get Cali-Mex delivered directly to their Junk Boat with a click of a button! 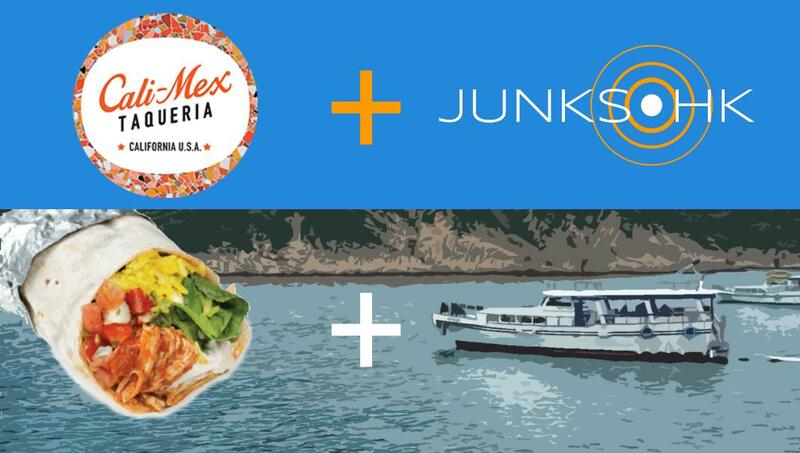 Cali-Mex & Junks.hk announced earlier this week the addition of Cali-Mex’s famed California Style Mexican food to the Junks.hk online Junk boat booking platform. Available from today to all Junks.hk customers who can now have great Califronia style Mexican food delivered directly to the boat! This new partnership aims to take much of the hassle out of organising a boat trip in Hong Kong. Until now consumers were forced to organise their junk trip offline and organise their food and beverage separately but not any more! Now you can select the junk, food, and beverage you desire in one easy and intuitive process. With Cali-Mex this means you can choose from a range of combinations including their signature burritos, nachos, quesadillas and salads as well as their unique Jarritos soft drinks (coming soon). “At Junks.hk we are committed to making each junk trip a unique experience. Cali-Mex has great high quality products to offer so we are proud to include them as our business partner.” said Benjamin Hadfield, Co-founder of Junks.hk. “This partnership will help ensure that the masses can combine the food that they enjoy around town at Cali-Mex’s stores in the comfort and luxury of a Junk, one of Hong Kong’s greatest pastimes”. The Cali-Mex packages on offer suit between 10-15 adults which gives customers the flexibility to choose as much as they need for their party. The size of the packages gives users the opportunity to mix and match a variety of packages to suit a wide range of tastebuds and requirements while still offering great value. Check Junks.hk out today for these and much more great deals! So, this weekend the team at Junks.hk were down at Central Pier No.9 handing out free beers to revelers (because that's the kind of good folks we are). While engaging with our fans we heard a number of horror stories of junk boats and even saw one unfold. Some from previous experiences in booking junks, some were down to bad planning, and a lot of it was just watching people trying to perform their own logistics in getting their food and alcohol to the boat. Geez! In fact, two ladies were ditched because they didn't make it on time. It sure is a cruel world! Head out early - Everything always seems to take longer than you expect when you are in a rush. Head out 15 minutes earlier than you think to avoid unnecessary stress. And even if you are early you can run to 7/11 for last minute supplies or start the party early on the pier. Let someone else bring the beer - We all know what it's like to go outside it HK summer. Now add carrying heavy drinks to that. #dying At junks.hk you can get fantastic craft beer from AmeriCraft delivered directly to your boat. Check out combos here. Use your smart phone - Pier 9 on a weekend in summer is total chaos. Boats are coming in and out every minute and it's hard to tell which one to get on. At Junks.hk we make it easy by sharing all the information with you when you make the booking. Just keep an eye out for your vessel number then give them a call and they'll be at the dock within moments! Get the food catered, more time to sleep in! - Organizing buying and bringing food to a junk can be a huge hassle. Especially at 9am on a Saturday! With junks.hk you can pick from a variety of great catering options such a Chicken on the Run to cater your entire boat! See what you can feast on here. Book a private bus #partybus - If you have been to Sai Kung you will be aware of the horrors of waiting for the 101M minibus in Hang Hau! The last thing you want on your day off is to wait in line to get on a bus for your Junk. Why not book a private bus for your whole party?! Keep a look out for new transportation options coming to Junks.hk soon. Local media kicks up a buzz about new online boat rental website in Hong Kong! Keep an eye out for Junks.hk in the media and around town! Junks.hk received its first media coverage yesterday with Coconuts Hong Kong! Take a look at the article in all its glory at Coconuts Hong Kong. Your frat boy mates want the one with the banana boat; your fancy pants girlfriends want canapés and champers; and the guys with serious beards want craft beer by the bucketload. You’re never going to please them all… right? WRONG, at least according to brand new online platform Junks.hk. Come check out our site. We are adding features by the day (yesterday we added this blog). Don't be afraid to sign up with us here or join our growing facebook and twitter fanbase to keep up to date with our goings on. Also, if you have any suggestions on any killer features you would like to see contact us! Book your next boat party online! New online marketplace lets you create and instantly book the perfect junk trip with the hottest brands from around town! Junks.hk is a brand new online platform designed to make booking a boat trip in Hong Kong hassle-free. Instead of wasting hours arranging the ideal boat party, Junks.hk customers receive instant feedback on the availability of their boat of choice; can customize to their hearts content with trendy food, beverage, watersports; and instantly confirm their booking in one streamlined process. It all starts with the simple search criteria. When we reviewed the process of booking a junk we released that the only information customers really need to provide to find their boat is a date. That's it. No need for laborous enquiry forms just to be told that your boat isn't available for hire. With Junks.hk you see what is available for charter in real time! Want to personalise your junk boat experience? Junks.hk customers are spoilt for choice. The site features a range of top-quality restaurants and brands you know and love from around Hong Kong. With over 500 different combinations of boat, destination, food, beverage, and activities - a number only set to grow - a Junks.hk party will be unique every time.